Image: marcin jucha/Shutterstock. Design: Kenzie Mastroe/SheKnows. Pop quiz: How many jars of salsa have you bought over the years searching for that perfect balance of veggies and heat? That’s what we thought. When it comes to finding the perfect store-bought salsa, the struggle is real. That’s why we’ve taken the guesswork out of it and curated this list of the best store-bought salsas. 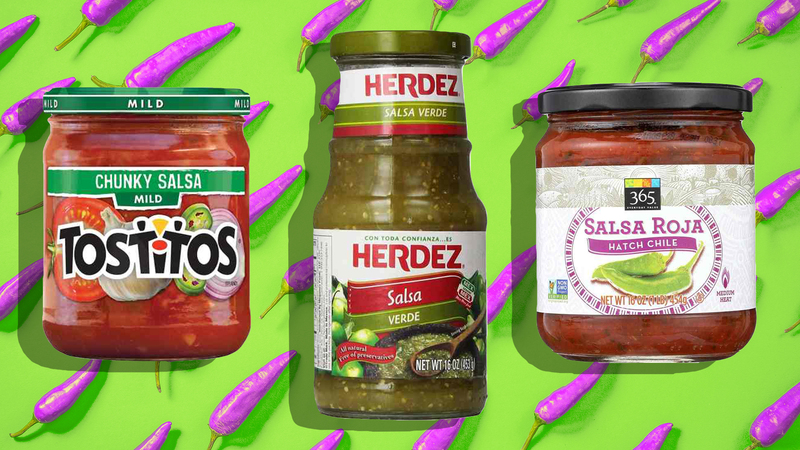 Whether you enjoy eating them with chips, using them in place of dressing on your salad or pouring them on your favorite Tex-Mex-inspired modern casserole, there’s a salsa brand (or three) on this list for you. And because we know there’s more than one way to love salsa, we’ve included a variety of salsa styles and heat levels to please any palate. Our ranking is based on a combination of personal experience, online reviews and recommendations. La Victoria Suprema’s main claim to fame is that it’s onion-free, perfect for those with allergies or aversions who still want to get their salsa on. Better yet, its fresh flavor means it will complement a variety of dishes. Even the medium heat might be a bit on the mild side for those who prefer a little spice, but it’s just right for anyone who’s sensitive to spice or as a way to use the bright, sunny tomato flavor to counteract over-spiced taco meat. From trusted Mexican brand Goya comes a fun salsa-pico hybrid. If you’re not a fan of salsas with a watery-ish base, this isn’t for you, but it’s largely regarded as a great cooking salsa. In lieu of using it as a dip, use it to cook chilies or as a liquid to cook meats in your slow cooker or mix it up with mac and cheese and browned ground beef. This brand is exactly what it sounds like: salsa for gringos by gringos. While that might sound like blasphemy, Green Mountain Gringo does have a unique flavor profile that makes it beloved by many. Its flavor is bright, sunny and sweet without the added sugar many brands use to get that fresh-off-the-vine tomato flavor — but it doesn’t really have a lot of spice, so if that’s what you’re looking for, choose another brand from this list or be prepared to add some jalapeños. 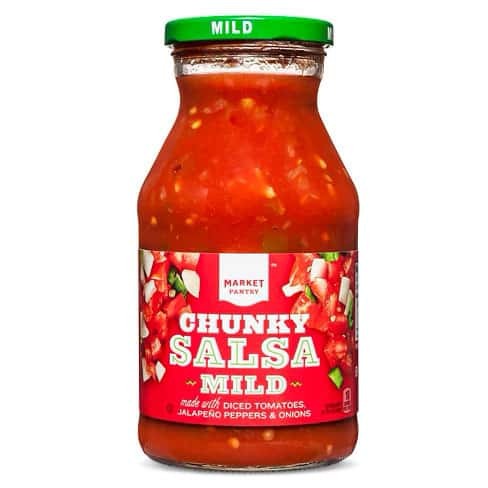 Target’s store brand, Market Pantry, produces one of the best economical salsas around. It’s a great option for a houseful of picky eaters, as it doesn’t have much spice, isn’t too sweet and isn’t too salty. One commenter suggested that those who like spice can just stir in a little cayenne to amp the heat level, and you can also add a pinch of sugar or salt for those who like it that way. There is a distinct oniony flavor, though, so if one of your picky eaters is onion-averse, stick with the La Victoria. Tostitos is the top contender of the “generic,” available-everywhere brands. And that’s not necessarily a bad thing (unless that’s not what you’re looking for). Its chunky style is thick, whereas many similar brands have nothing but chunks submerged in tomato juice, and the flavor is just the right balance of heat and acidity. This salsa will be beloved by some, especially those with less adventurous palates, and better than just unoffensive to everyone else. 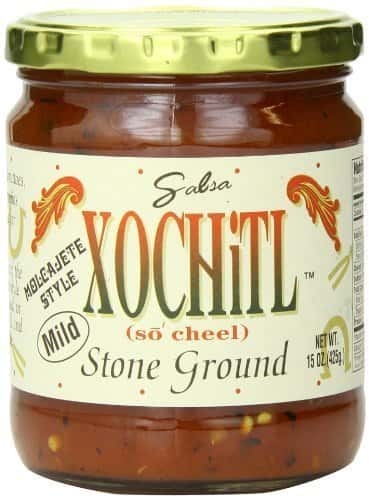 Xochitl Stone Ground Salsa got rave reviews from Taste of Home, and rightfully so. It’s lightly smoky and extremely flavorful. It’s also a tad spicy when compared with other mild salsas, so bear that in mind when making your choice. The Taste of Home testers’ only complaint was that it was the consistency of gazpacho (which not everyone minded). However, since it was a blind taste test, they didn’t have the benefit of seeing it was labeled “molcajete-style” (made in a stone mortar and pestle), which when using whole tomatoes could explain the texture. But most people will likely give the texture a pass based on the flavor. Most of Amazon’s 365 Every Day Value salsas get good reviews, but their Hatch chile salsa is one of the best reviewed. Hatch chiles are sweeter than most of the peppers used in salsas, but they do still bring a little heat. Salsa verde, which literally means “green sauce,” is made with tomatillos instead of tomatoes. While tomatillo means “small tomato,” they aren’t tomatoes at all. They taste a bit like a tomato and a lemon had a baby, meaning they’re not as sweet as a tomato and more acidic. This salsa verde from Herdez is a staple in many parts of the Southwest and in Mexico because of its pleasant flavor, overall balance and unobtrusive heat. It’s not uncommon for verdes to be thinner than rojas (“reds,” aka tomato-based salsas), so if you’re serving it at a party, make sure each guest has their own ramekin to control spillage. It also makes a delish chicken enchilada or tamale sauce in a pinch. Roasted salsas can be a mixed bag. So many of them are really just loaded with cumin and chili powder to mimic the smoky flavor of properly roasted tomatoes and veggies. This offering from Rick Bayless, chef owner of the Frontera restaurants (among other Mexican-inspired properties), is powered by legit double-roasted tomatoes and spiked with onion and jalapeño. Buy an individual jar or get a multipack on Amazon. Julio’s (not to be confused with the restaurant chain Uncle Julio’s) is the definition of “Tex-Mex restaurant-style salsa.” The flavor is well-balanced and the texture isn’t too thick or too thin. It comes in mild and hot, but be forewarned: The “mild” might be closer to some brands’ medium designations, and while the hot isn’t as scorching as some of the brands that proudly offer cruel and unusual self-torture condiments, it’s got more than a small kick. This cult-favorite Texas salsa isn’t as widely available nationwide as some of the others on this list might be, but you can pick it up online (usually only if you’re willing to commit to a larger order). If you’re looking in your grocery store, don’t forget the check the refrigerator section, as they sell both jarred salsas and tubbed salsas that have to stay refrigerated even before opening.